On January 18th of this year, my culinary interests grew dramatically after reading an article, of all places, in the Wall Street Journal. (Like here for subscribers of WSJ) The article, The Latest DIY Craze? Say Cheese (and Other Dairy) sparked my interest in trying to make cheese. Until reading that I thought that to make cheese you had to be Amish, a dairy farmer, from Switzerland or at least live in Wisconsin. Regardless, I envisioned lots of equipment and time, specialty molds and strange ingredients. What I found, at least for basic Mozzarella cheese, it is a piece of cake (cheesecake?). What do you need to make cheese? Milk – This is a no brainer, but the type of milk is important. I thought you needed some organic thing, but what really matters is the level of pasteurization. Ultra-pasteurized? Not good milk for cheese. Pasteurized at a high temperature? Also bad. Here in the Cleveland area, Smith’s Dairy (look for the yellow jug), works well as it is pasteurized but at a lower temperature. And get the freshest milk you can. Enzymes – Here is where it sounds odd, but it really isn’t. In order for the milk to curdle, we have to “undo” some of what was done in standard milk processing (homogenization and pasteurization). The milk needs to curdle at some point. The enzymes (rennet, citric acid, calcium chloride and flaked salt) are easily found on the intranet and inexpensive. I performed a quick search for the enzymes and found that one of the best places to buy them is Leeners. Leeners is primarily an online store that specializes in helping home chefs make a wide variety of items from cheese and sausages to beer and wine. Their one physical location is right here in the Cleveland area. So I drove out one of the few snowy nights we’ve had here this year and walked in 30 minutes before they closed. A great shop, and a fantastic lady who talked to me quite a bit about making cheese. She even told me where to buy my milk. One mozzarella making kit later, I was out the door. I have not tried other sites, but I strongly recommend Leeners as they are reasonable and so helpful. Even their website has quite a bit of educational information. There are plenty of step by step guides on the Internet, so I won’t recreate them here, but I will give you a sense of how easy it is. 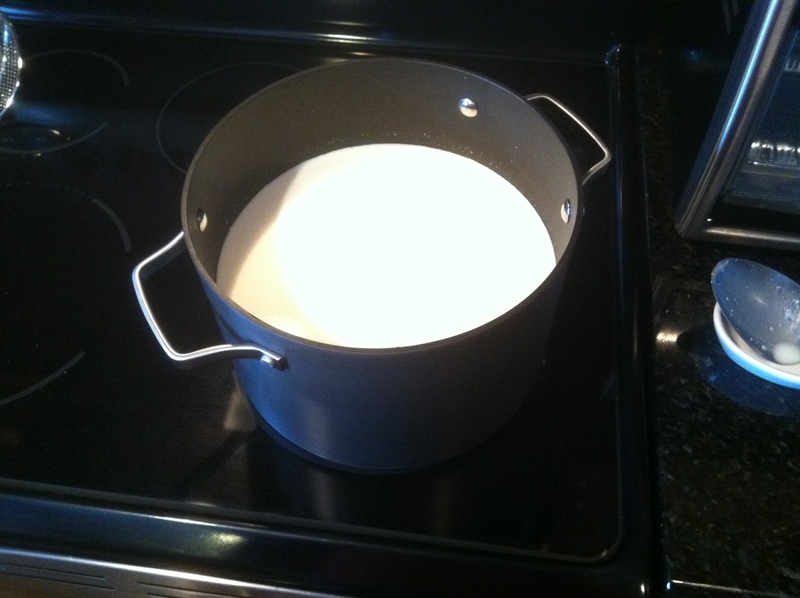 Step 1 – Slowly heat the milk. Do not rush this step. The second time I made cheese, I rushed it and the taste was not nearly as good. The milk needs to get up to 88 degrees (Back to the Future anyone???). Step 2 – Add enzymes and wait. You have to let the milk separate into curds and whey. 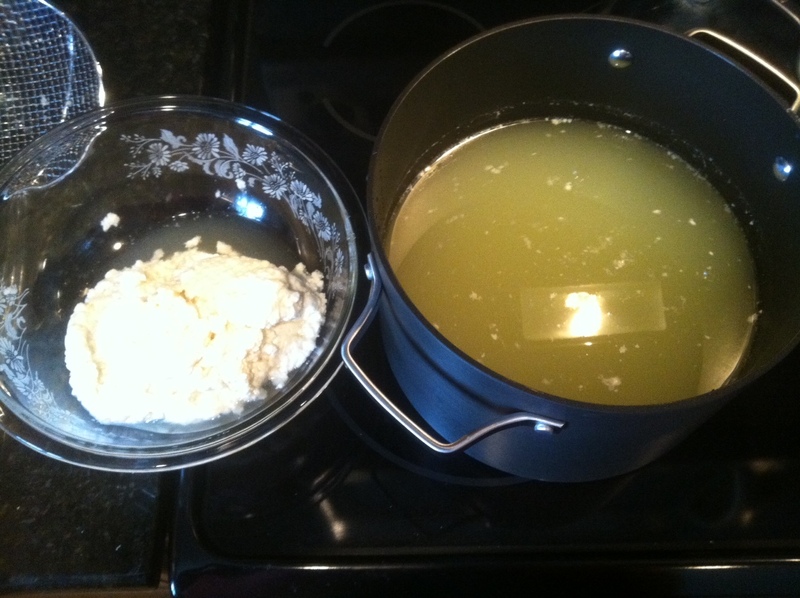 Step 3 – Little Miss Muffet moment – Separate your curds and whey. Gently drain as much whey (liquid) from the curds as you can. If you are not gentle you may lose some consistency. Heat the curds. Drain. Heat the curds. 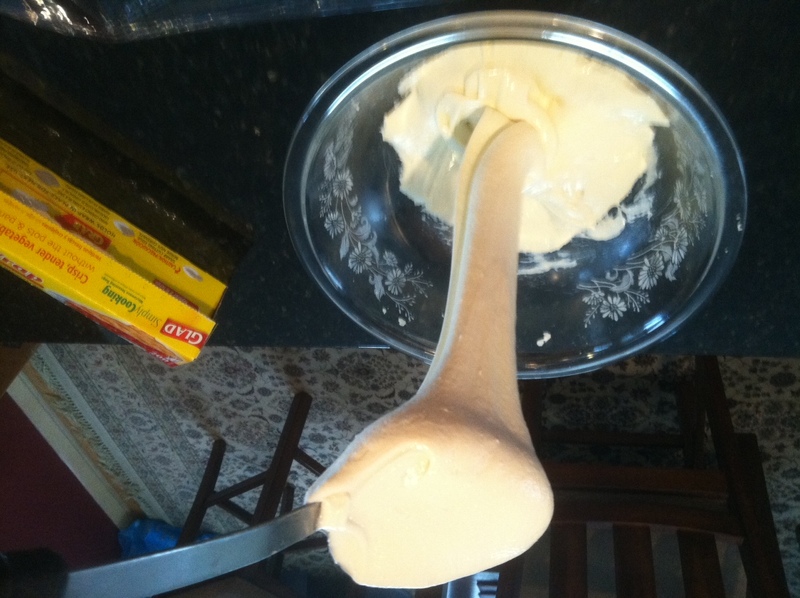 Step 4 – Stretch the cheese – This gives it the traditional mouth feel of Mozzarella. It looks like I am pouring batter, but it is soft cheese being pulled by the spoon. Step 5 – Shape, wrap and cool. I made mine into a log (vs the traditional ball of Mozzarella you see), as I was planning on slicing it. The one gallon of milk make a “brick” of cheese that is 1.1 lbs. Step 6 – Cut the cheese (yes…I am a middle school boy at heart) and EAT. The cheese is so creamy and milky. It is not the rubbery cheap stuff you get in the grocery. I made a crostini out of a baguette by slicing on the diagonal, rubbing it with garlic and butter and toasting it. A 1/4″ slice of fresh Mozz, a 1/2 basil leaf and a slice from a Roma tomato. Caprese salad on crostini. Yum. The kit cost me $25 but included a good low temp food thermometer (which you need) and all the enzymes. You have enough to make 10 bricks and won’t have to re-buy the thermometer. I estimate that I didn’t save any or it won’t cost me any (after multiple bricks) than buying it in the store, but the quality was so much higher. Great job! Cheese making and cheese waxing (preservation technique) are two things I’ve been wanting to try for years. Your post makes it look much less intimidating than I had imagined and the results look delicious! I have one of these cheese kits but have yet to use it (I usually just make ricotta, which doesn’t require anything beyond vinegar). This is motivating me! You really should try it. In making the mozz, you can take they whey and use it (with a little more milk) to make ricotta. So making them both at the same time really maximizes your ingredients. oh hurray cheese! i hope to be making cheese for a club get together later this year. I have been dying to try this. The cost of 16 oz mozz here is close to $5 so a $25 kit that makes 10+ lbs is a huge savings! I think I am convinced to give it a try. Keep in m ind you have the gallon per pound of milk, so the savings is still there but much less. Aha! Yes the cheese probably wouldn’t have been very good without the milk. 😉 Still worth it!